If you want to make some of your own tweets, help us twitter jam the superbowl convo by using hashtags #sorrycokeandpepsi, #SB48, #SuperBowl, #Seahawks, #Broncos, and #SodaStream! 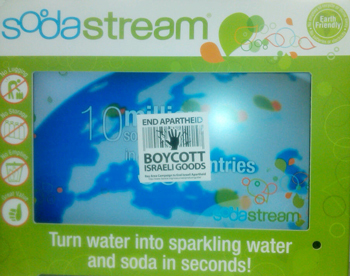 On July 19 the Swedish News Agency (TT) reported that Coop has decided to terminate all purchases of Soda Stream carbonation devices after it was revealed that they are still produced in the occupied Palestinian territories (oPt). Selling products from occupied territories disputes Coop’s own ethical standard as well as Global Compact, the UN ethical guidelines for businesses.